Although the wedding ceremony may take less than an hour during 10 hours of photography coverage, those minutes are some of the most important of the wedding day. Whether you have your ceremony outdoors on a sandy beach, in a gazebo, in a forest, on a grassy lawn of a park or your backyard, a terrace, overlooking the ocean, or whether you have it indoors in a church or chapel, a hotel ballroom, a barn, or a museum, the photos of the moments when the bride and groom exchange vows are some of the most poignant and emotional of the day. There are many favorite ceremony moments. We love the feeling of anticipation when the bride is about to walk down the aisle. There are always so many moments of laughter and tears when the couple exchange their vows - especially if they write their own meaningful words to each other. Capturing the reactions of the parents and family who are seated in the first rows of the ceremony is always important to us. After all, as your wedding photographers we are your other set of eyes - documenting not only what you see throughout the ceremony, but also all you don't get the chance to see. We love when couples look through their wedding ceremony photos, and are so surprised to see their grandfather wiping away a tear or the little flower girl playing with her basket in the aisle. This church ceremony wedding photo is one of our favorites. There is a seriousness about it that is a reminder of the meaning and importance of the tradition of wedding ceremonies. 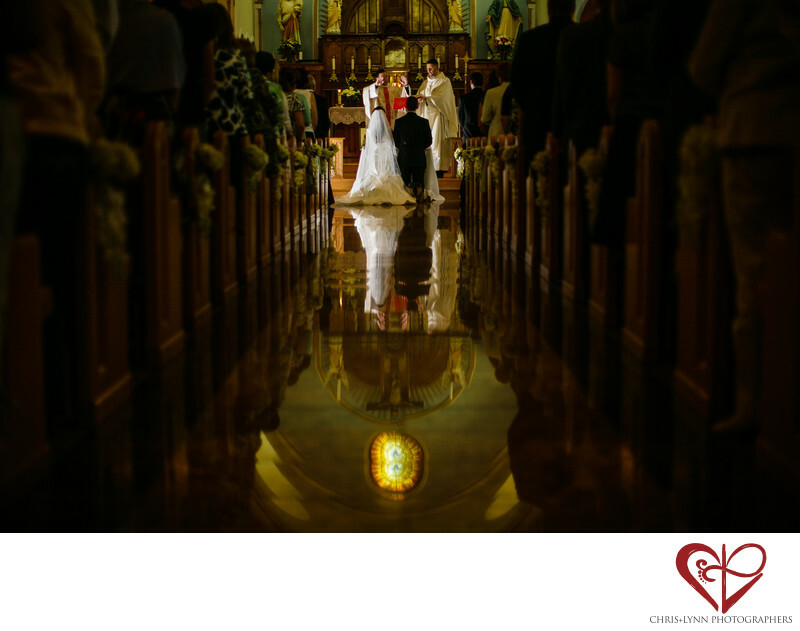 The reflection of the couple in the marble floor of the church and the light illuminating the couple add interest to the image. 1/640; f/1.4; ISO 800; 50.0 mm.